Matta Gawa is a duo from Washington, D.C. that features Edward Ricart on guitar and Sam Lohman on drums. They play a unique blend of improvisational, pyschedelic avant-rock and free jazz. I caught up with Ed for an interview this week. Keir Neuringer: Your upcoming show is your second visit to Ithaca, correct? How often does MG play out as a duo? How often do you tour? 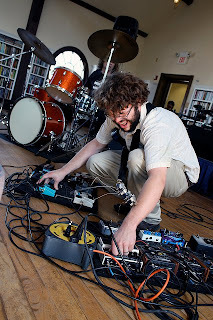 Edward Ricart: Our gig in September 2010 was our first time in Ithaca, but Sam Lohman (drummer) has played in town a number of times over the years. Matta Gawa has been a primary focus for both of us--it's so easy to tour and operate as a duo, that we are really able to get out and move without a huge van--and it's easier to coordinate two schedules than four or five. We have done a number of shorter tours--generally 10 days or so, through the mid-Atlantic, and spent almost two months on the road last year. We play out as often as we can, mostly in DC, Philly, and NYC. It is great to be on the road, meeting people, hearing new music, and checking out new places (and places to eat). KN: You are both a performer and an organizer back home. Tell us about your local scene. What makes you proud? What exasperates you? ER: Washington DC has such a rich history of creative music--from Duke Ellington and Go Go music through to Fugazi--and it has been a destination for avant jazz artists for many years, thanks to the efforts of a number of local presenters. I grew up listening to punk rock, and the music from labels like SST, Dischord Records, and Touch and Go, before I started digging into free jazz, new music, and bebop. Dischord is a Washington DC based label, and is the quintessential American DIY indie label. The same do-it-yourself ethos and spirit can be identified in the creative jazz scene as well...for example, Sun Ra self-released his own music as far back as the 1950s. So the spirit of the two musics is really quite similar, even though there are huge sonic differences. This spirit has been a huge influence on how I operate. I've been running a concert series in DC for the past two years, and the music has been outstanding. 100% of the proceeds from ticket sales are paid to the artists, and I try to keep the shows fairly early, and the tickets affordable to ensure the music is available to everyone in the community. It is a pleasure to help out touring creative musicians, and I've made some great friends through the series. Nevertheless, it is difficult to get recognition from the more indie rock oriented websites in town, and while Michael West at the DC City Paper has been supportive, and the series was voted 'best in DC' last year, the Washington Post doesn't really cover the series. KN: What works at home for reaching audiences? ER: Recently, the DC scene has moved out of the clubs and into non-traditional spaces like houses, galleries, and lofts. These have become the best spots in town, since people go to these places totally open to hearing whatever is being presented, even if they aren't really sure what type of musical experience to expect, and they actively listen to the music and get off on it, even if its outside of their comfort zone. There's definitely pluses and minuses to our scene, but they're probably the same pluses and minuses that people face everywhere else. DC is unique in that despite the great museums in town, unless you're lucky, the city is prohibitively expensive for most artists to entertain the idea of living there. So it really can be a grind making ends meet, which is probably less of an issue in many other cities. As a result, the community of creative musicians and artists is smaller than it should be. Nevetheless, we're very close to NYC, Baltimore, Philadelphia, and Richmond, and it seems like there's a lot of interaction and exchange between all of these places. KN: Particularly rewarding interactions on the road? At home? Tour horror stories? ER: We love meeting new people, hearing new music, playing, and catching up with old friends. The few tour horror stories that come to mind involve unsanitary accommodations (the Travelodge in Florence, South Carolina comes to mind- don't go there!) but I'll spare you the gruesome details. Everybody I have met on this tour has been great- we've mostly been through the South this time, and the experience has been excellent. KN: Your list of influences is intriguingly diverse and lists some folks who reached for the stars, literally. Can you say anything about MG's aspirations? How can you tell when people "get" your music? What are the influences that you feel strongly about, even if they're hard to hear in the music? ER: Our music is totally improvised, without any planning or discussion--so no preset chord changes, melodies, or rhythms. But we definitely strive to play together, and interact spontaneously and naturally within the context of this band. We try to express ourselves as freely and completely on our instruments as we are able to. As far as influences are concerned, it might sound a little hackneyed, but everything that happens over the course of the day (and in our lives) deeply influences the course of our performances in ways that are impossible to predict. Our actual musical influences are all over the place, and this seems to create a few different points of entry to the music for listeners who might not typically be interested in listening to free jazz or anything 'avant garde'. At the very least, we try to provide challenging, thoughtful entertainment to anyone willing to listen. We'd love to find ourselves on the road even more than we already are, and continue to record, play, and develop. KN: Your album bA [Engine Studios 2010] got some rave reviews. The blog Something Else wrote "Able to create huge mind-blowing sonic soundscapes from only a guitar and drums, these two guys are punk jazz's version of The Black Keys." What is the relationship between the record and your live shows? Has putting out this record helped with organizing shows? ER: I think we are a much more cohesive group now, and we're self-releasing some newer music on a label that I have started with bassist Jason Ajemian later this year. We are also recording our next record for Engine Studios on the last day of our tour, so that should be out in the Fall. After touring in the fall and basically touring most of this year (solo and with MG), I feel that our chops and ears are definitely up well beyond where they were for that last record. 'bA' is actually my first record, and you can apparently buy it at most of the major chain retailers, so its nice to know that people can see us play somewhere, and then easily pick up or order our record. KN: You both have worked with an impressive roster of heavyweights. What's on the horizon for the band, or for you two individually? We each have some new recordings coming out this year- the two Matta Gawa records, but Sam has something coming out with Iggy Pop and Steve Mackay of the Stooges on it. I have a handful of 'jazz' records coming out this year, like a quartet disc with Herb Robertson, Andrew Barker, and Jason Ajemian on the British label SLAM. Sam and I also recorded our Octet with Roy Campbell, Steve Swell, Vattel Cherry + Jason Ajemian, Andrew Barker, and a great alto player from DC named Aaron Martin, and it should be coming out later this year. We had a blast playing some more gigs with Marshall Allen of the Sun Ra Arkestra late last year, and I just recorded a record with a great saxophonist from Philly named Elliott Levin (who has spent years working with legendary pianist Cecil Taylor). We have been talking to our friend (experimental guitarist) Elliott Sharp about bringing him out on the road with Matta Gawa. I will be playing in a big band in NYC every Wednedsay in March with Ajemian, saxophonist Matt Bauder, and some other great musicians, and will be living in Chicago for most of April. KN: Favorite venues? Favorite towns to roll into to play? Favorite road food? ER: I really have a great time everywhere. It is nice when people show up to the gig, but there's something to be said for just putting a gig on the calendar, showing up, and making the most of whatever happens--even stuff like bad weather and equipment failure can still make for a positive experience overall. We are definitely doing this to enjoy it. I try to find special eats in each city--the real fuel of the whole thing is coffee, the most important meal of the day--and some good friends turned me on to a french press travel mug so I can mostly steer clear of the stuff at the gas station. KN: What are you listening to these days? Anything you'd like to get people to look into? ER: I think Sam listens to the radio more than anything else, and I am always amazed to hear the wild music he can find on the airwaves. We have a great independent station in DC called WPFW that we can highly recommend. The Steve Lacy record Disposability is a must hear. I heard a great CD from Lee Morgan and Clifford Jordan today, lots of Derek Bailey, Charles Tyler, Art Blakey, Noah Howard, Tony Oxley, Masayuki Takayanagi, E-40, Kazuo Imai, Peter Brotzmann, Axel Dorner, Giacinto Scelsi, Cecil Taylor...A good friend lent me John Litweiler's book on Ornette Coleman, and I would definitely recommend it. For readers interested in learning more about the independent jazz movement from the 60s to the 1980s, check out Freedom Rhythm & Sound, a great book of 'revolutionary jazz' cover art filled with obscure records (many of which have been reissued on CD) that I have been trying to collect. Hear Matta Gawa play an Ithaca Underground show at CSMA (Community School for Music and Arts) in Ithaca on Sunday, February 27, with Keir Neuringer and Mouth To Mouth To Mouth. Entry for the 8PM show is $5 and all ages.